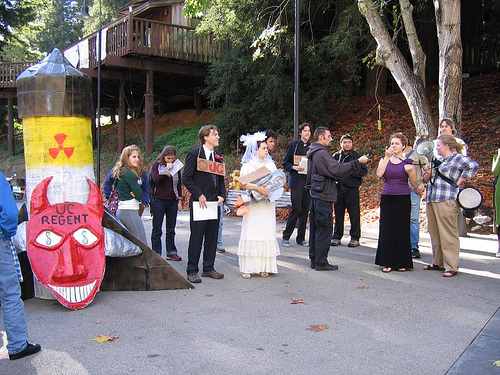 A speech read by Steve Stormoen of UCSC Students Against War at the November 30th "De-Nuke UC" Day of action at UC Santa Cruz, against the nuclear weapons labs at Los Alamos and Lawrence Livermore. The protest featured a wedding ceremony between the UC and Bechtel, many informative speakers, and a community art project in the form of an 8 foot papier-mache warhead. "Speak now, or forever hold your peace." Well, some students spoke. "Who is the UC? Is it the students, faculty, and staff? Real people from all different ethnic and financial backgrounds who are committed to the cause of education, real people who need to make a living? 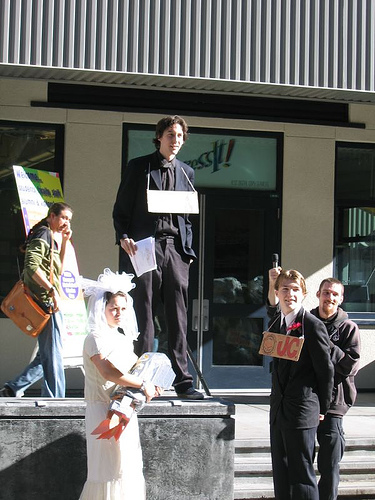 Or is it our Regents – the UC's decision making body, who sit on an average of twelve multinational corporations each? Who is the Bechtel Corporation? Is it their employees? Or is it their executives? Which of those groups do you think decided to, for example, walk into Bolivia and privatize a water supply that had been free to indigenous people for thousands of years? Which of those groups do you think decided to sue the already destitute community when they wouldn't pay up? Which of those groups decided to join the UC bid on the Los Alamos nuclear weapons lab, and which group from the UC decided to bid right along with them? Let me ask you another question. Who is the Los Alamos Lab? Is it their employees or their directors? Who decided that nuclear weapons projects would account for 80% of the lab's multi-billion dollar budget. Well, that answer would be the Department of Energy. See, this movement of ours goes back to the 50's, when World War II was over, the necessity of getting nuclear weapons wasn't so urgent, and UC students, faculty, and staff, as well as many Washington politicians, felt that it would be better to untie the relationship between the UC and the nuclear weapons industry, and get the government to do managerial duties instead. However, the Department of Energy enjoyed the beneficent public image the lab attained under UC management, and the UC Regents decided that they preferred to be involved in making nukes as well, saying it was their “public duty�? to contribute in this way to our “national security�?. As regents have come and gone every twelve years, this line has remained constant for the last fifty. Some iterations of this movement in the past have tried to address the issue of the labs with the Regents in a different way. They didn't ask “why do we manage the labs�?, they asked, “why do our labs make nuclear weapons�?? That brought out another classic regent defense: “We don't make the policy, we just do the science.�? In other words, “we don't make decisions, we make bombs�?. Yes, these are the same regents that voted to raise our student fees again, and cut aid again a couple weeks ago. These are the same regents that have kept clerical and service wages at basement levels, while top executives are bringing home ridiculous record salaries and bonuses. See, on the one hand of the UC is my mom, who's been working at UCSB for almost as long as I've been alive. Except, as a single mom, she couldn't afford to live in the same town she worked, and now has to commute from a small town 40 miles north, which is right by Vandenberg Air Force Base, a potential major military target. Nuclear weapons only make this reality more dangerous: not just for my mom, but for all of us. LANL's reliable renewal program effectively breaches the international Nuclear Non-Proliferation treaty by replacing aging warheads, which should be disarmed and taken off our arsenal, according to the treaty, with brand new warheads, even warheads with expanded capabilities. This treaty is supposed to be our main deterrent from preventing other states from attaining nuclear weapons, and convincing those who do to disarm. But how could we possibly expect other countries to disarm when we won't act in good faith to do so ourselves? Now, on the other side of the UC is Richard Blum, the husband and financier of Dianne Feinstein, former chair as of last month of the URS corporation, which does multi-million dollar business with Los Alamos. 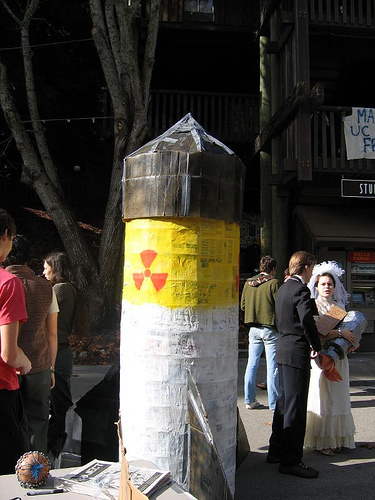 Blum expects the role of nuclear weapons at Los Alamos to go up even further, and actually engage in wide-scale manufacturing of plutonium pits – the core of the modern nuclear warhead. This is why the Bechtel corporation has been involved with the bid, to make the process of manufacturing more feasible and more likely. Like I mentioned before, the compensation of UC executives has gone through the roof in recent years, and so has student fees. This is done to make executive salaries “competitive with those in the private sector�?, in order to supposedly attract the top corporate talent. Well, I've watched educational programs from this campus cut, I've watched students no longer be able to afford to go here, and I've watched our University be complicit in the business of nuclear weapons, and I have to say, maybe we don't want top corporate talent managing our universities. Maybe we should have dedicated educators running this place instead, who won't act to make the University profitable, to blur the lines between a University like ours and a Corporation like Bechtel's, but to make it the best education institution possible. There are, clearly, two sides to this university. Which side are you on?" 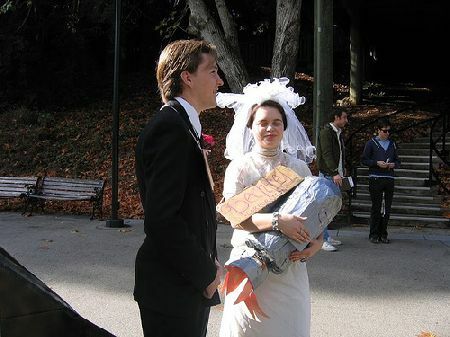 A happily married university and corporation, in debt and in profit. 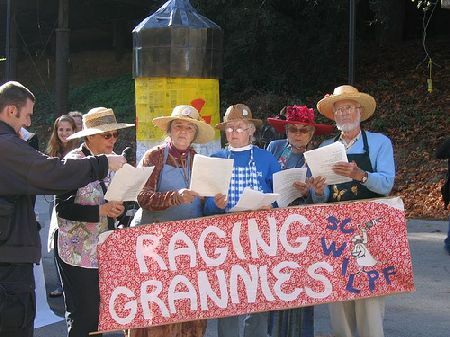 The Raging Grannies provided the event's soundtrack. 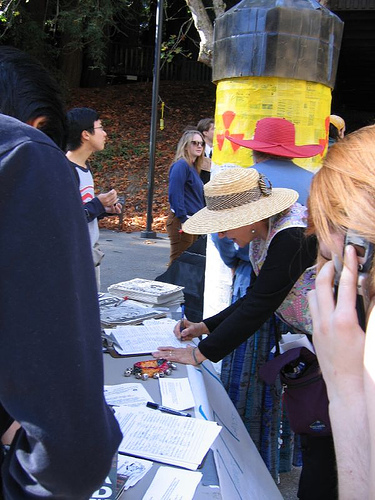 Voicing their opposition, students and community members call the office of the president, and sign the bomb and the petition. 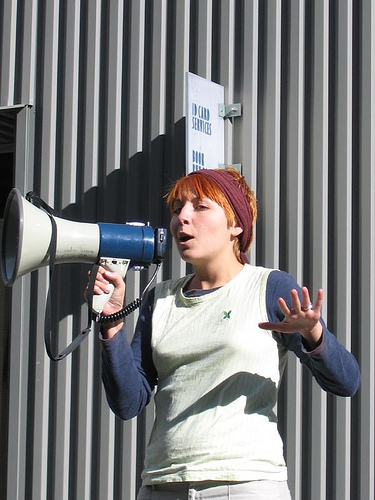 The event was rounded out by empassioned and informed student speakers.